With search campaigns, you can show your ads for keywords you think are relevant. And then you can easily see which keywords are performing well and providing the best ROI. The results then guide you how to bid higher for better-performing keywords and lower or not at all for lower margin or low performing keywords. But this doesn’t work for Shopping campaigns – Why? Because with shopping, campaigns rely on Google correctly interpreting your shopping feed to match relevant searches to your products. So assuming that your feed is relevantly structured, this article will help you hone your campaign structure for Shopping in the AdWords interface, offering much more control over your marketing budget by allocating more budget to product areas with better performance and less budget to product areas with poorer performance, ultimate giving you a much higher return on ad spend – as much as 300% more. One approach uses a 3-tier campaign structure it’s in simplest form, splitting out your products into top seller’s, then average or, moderate sellers whether it be by brand or category and then the remainder of products that usually convert to a lesser degree or not at all. It also uses negative keyword structure overlays to direct the flow of traffic to the best campaign and bidding level combined with an inverse bid priority setting. Firstly, all search queries fall into the top campaign layer with the high priority setting and lower bids. Because there are phrase match brand and/or category negative keywords as well as the top-selling exact match keywords set as negatives, any search query that matches these negative keywords will be pushed down to the next campaign which has medium bids and set at medium priority. So those search queries that were filtered out of the catch-all campaign and pushed down to the medium campaign are now cross-checked against the exact match negative keywords. If they don’t match any of them they get a medium bid as expected. If one of the searches is one of the exact match negative keywords (top sellers) they are then pulled out and pushed down to the next campaign which is the top seller’s campaign with highest bids and lowest priority. At this final layer, your bids are set high because you know that any search query that lands here is much more likely to lead to a sale. And when you review your search query report you should only see searches that match these top selling searches queries, which over time will evolve as the campaign progresses with more data coming through at each level. Filter out those search queries that have shown the best performance which you will use as exact match negative keywords – these are your top sellers. 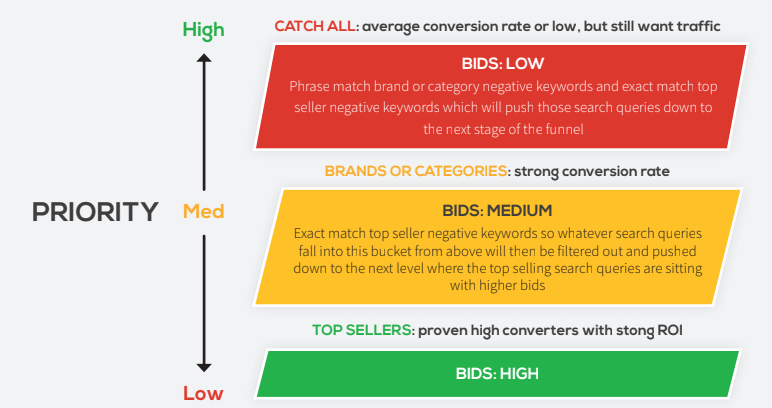 With the negative keyword list from above that is phrase matched (moderate sellers) as well as the exact match negative keywords (top sellers) add them to the Catch all, high priority campaign. Review search query reports and find those brands or product categories that show moderate conversion performance. You then create a negative keyword list of those keywords using phrase match typically. With the negative keyword list from above, that is phrase matched (moderate sellers) as well as the exact match negative keywords (top sellers) add them to the Catch all, low priority setting campaign. The beauty of this approach is that you have more control over what searches you shopping campaign budgets go to, because you have analysed the performance and understood the search intent on the keyword level and thereby helping Google deliver the better-placed product bid for the search intent. To see how we helped a client turn $1 into $6 and more, check out this video. Digital Advocates was founded by Raph Sebbag, with over 10 years’ experience in sales, marketing and training, mainly within the digital arena. After being immersed in the Online Marketing space for much of this time working with the likes of Allied Pickfords & RACV, and hundreds other small to medium business across Australia, Raph started his own accredited Premier Google Partner AdWords agency in Melbourne. His motivating philosophy is aimed at injecting integrity back into the Online Marketing space providing businesses with transparent, practical and measurable AdWords services with a profit-driven approach to client results. Which Digital Marketing Channel Is King?